Wikimedia Commons has media related to Military of Montenegro. The Armed Forces of Serbia and Montenegro included ground forces with internal and border troops, naval forces, air and air defense forces, and civil defense. Preceding the VSCG was the Armed Forces of Yugoslavia from the remnants of the Yugoslav People's Army (JNA), the military of SFR Yugoslavia. The state, then named Federal Republic of Yugoslavia, participated in the Yugoslav Wars with limited direct intervention of its own armed forces. Following the end of the Wars and the constitutional reforms of 2003 by which the state was renamed "Serbia and Montenegro", the military accordingly changed its name. The military was heavily involved in combating Albanian separatists during the Kosovo War and Preševo Valley conflict, and also engaged NATO airplanes during the 1999 NATO bombing of Yugoslavia. Arsenije "Arso" Jovanović was a Yugoslav partisan general and their foremost military commander to participate in World War II in Yugoslavia. The Montenegrin First League of Men's Handball is the top men's team handball league in Montenegro. It is organized by the Handball Federation of Montenegro. 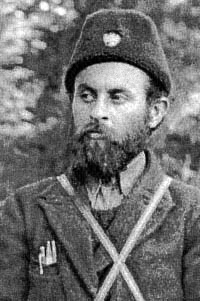 Pavle Đurišić was a Montenegrin Serb regular officer of the Royal Yugoslav Army who became a Chetnik commander (vojvoda) and led a significant proportion of the Chetniks in Montenegro during World War II. He distinguished himself and became one of the main commanders during the popular uprising against the Italians in Montenegro in July 1941, but later collaborated with the Italians in actions against the Communist-led Yugoslav Partisans. In 1943, his troops carried out several massacres against the Muslim population of Bosnia, Herzegovina and the Sandžak, and participated in the anti-Partisan Case White offensive alongside Italian forces. Đurišić was captured by the Germans in May 1943, escaped and was recaptured. Montenegrin Ground Army is the primary component of Military of Montenegro. The Uprising in Montenegro (Montenegrin: Ustanak u Crnoj Gori), commonly known as the 13 July Uprising (Montenegrin: Trinaestojulski ustanak) was an uprising against Italian occupation forces in Montenegro. Initiated by the Communist Party of Yugoslavia on 13 July 1941, it was suppressed within six weeks, but continued at a much lower intensity until December 1941. The insurgents were led by a combination of communists and former Royal Yugoslav Army officers from Montenegro. Some of the officers had recently been released from prisoner-of-war camps following their capture during the invasion of Yugoslavia. The communists managed the organisation and provided political commissars, while the insurgent military forces were led by former officers. The entire nation rejected the privileged position offered by its occupiers, rejected the capitulation in order to fight for Yugoslavia, together with "Russia".